1. Nisha Pillai is a journalist based in London. 2. She is one of the main news anchors with BBC World News. 3. Pillai was born in Kolkata, India and grew up in Mumbai. 4. When she was 14, her family moved to London, England. 5. She attended a girls school in Birmingham, then graduated in analytical economics at the London School of Economics. 1. After university she joined Schroders Investment Bank, then moved into journalism with the weekly Investors Chronicle. 2. 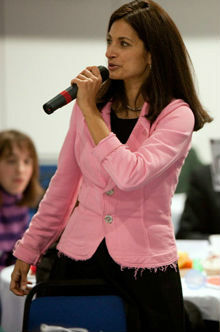 Pillai joined the BBC in 1986, first working on The Money Programme, then Panorama from 1990 to 1995. 3. Her nine-month investigation into financial affairs of media proprietor Robert Maxwell was presented as "The Max Factor", which won an award from the Royal Television Society in 1991. 4. Another of her notable programmes, titled "Underclass in Purdah", reported on Muslims in Britain, and predicted social turmoil and violence. 5. She joined the BBC World News channel in 1995 as one of the main anchors, presenting the hourly news reports. 6. In 1997 she presented the channel's coverage of Pakistan's 50th anniversary of independence in Islamabad, and, from Jerusalem in 1998, Israel's 50th anniversary of its declaration of independence. 7. More recently, Pillai gave live coverage of the September 11 attacks and the fall of Baghdad. 8. She has also hosted live interactive debates between audiences in America and in connected studios in Pakistan and Jordan. 9. She has also presented the BBC's flagship interview programme HARDtalk, and listed her most notable interviewees as Hindu nationalist Bal Thackeray of the Shiv Sena; musician Phil Collins; writer V. S. Naipaul; and Bollywood megastar Amitabh Bachchan. 10. Pillai also coaches senior executives in presentation skills at London Business School, records podcast interviews on economic analysis for a ratings agency, and facilitates many conferences and economic forums.